When I parked my car yesterday I noticed this hubcap on the grass next to my spot and realized it had been there a while because the weeds growing up through it. This wasn't anyplace rural or side of the road, it was right in the middle of an area of office buildings in Irvine, California. I assume I am one of the few people to have ever noticed this hubcap because it had been there so long. I had a camera in the car (as usual) and made a few photographs with it, then used my iPhone and Snapseed for these images above. I found these images interesting but I realize in the context of my work they probably will never find a home and thus not have much long term value. For that matter most exposures I make won't be of much use, but they do have a role and are an important part of the process of being a photographer. When it comes to photographing sports or any subject where I am photographing continuous frames its obvious most exposures will never be seen by anyone other than me. An example is when I photograph baseball, when I am trying to capture a great image of a batter, most the exposures will be of no use. At seven to ten frames per second I can easily make 30-50 exposures of a players at bat and only get one good image of bat/ball contact. Sometimes I might not get a decent image in any of a player's at bats in the entire game. Its similar with my documentary work, say walking the streets of New York, I may see something of interest coming towards me and make a burst of exposures and then chose the one image which is the best of the group. Sometimes I miss the image I see or the image I thought I saw just isn't there. I know what I am saying here isn't a revelation and most every photographer knows this, in fact most everyone who isn't a photographer also realizes every image isn't great. The thing younger photographers should remember is how different things are today with digital technology. With the cost and time of processing film, the physical space of the rolls, the slower fps of cameras, you made fewer exposures back in the day, you had to. You had to be selective and in with that I think we observed more. I am often questioned by "non-photographer" family members and friends why I photograph so much. I can't tell you how often have I heard "What are you going to do with that photograph?" from people that should have figured it out by now that photographing is what photographers do. Its part of seeing, its how photographers experience the world, and I know in my case there is a strong urge to document everything I come across. The part about the urge to photograph, to capture images, I can't fully explain. Maybe it has something with preserving my world, possibly it is about my own eternity. I don't know exactly and to be honest I don't really want to analyze why. I don't want to alter that desire or screw things up, if you are a photographer you probably get what I am saying. Some things don't in life don't need to be analyzed. Part of photographing process is how you see the world. I know for me I am constantly looking for images in the world whether or not if I am actually photographing. Shapes, juxtaposition of elements, light, interactions of people, combinations of elements that collectively have a deeper meaning, just all of that. I love visual contradictions and images with multiple layers that can be interpreted several ways. I have always noticed the details in the world, I see that as a blessing and a gift from God. 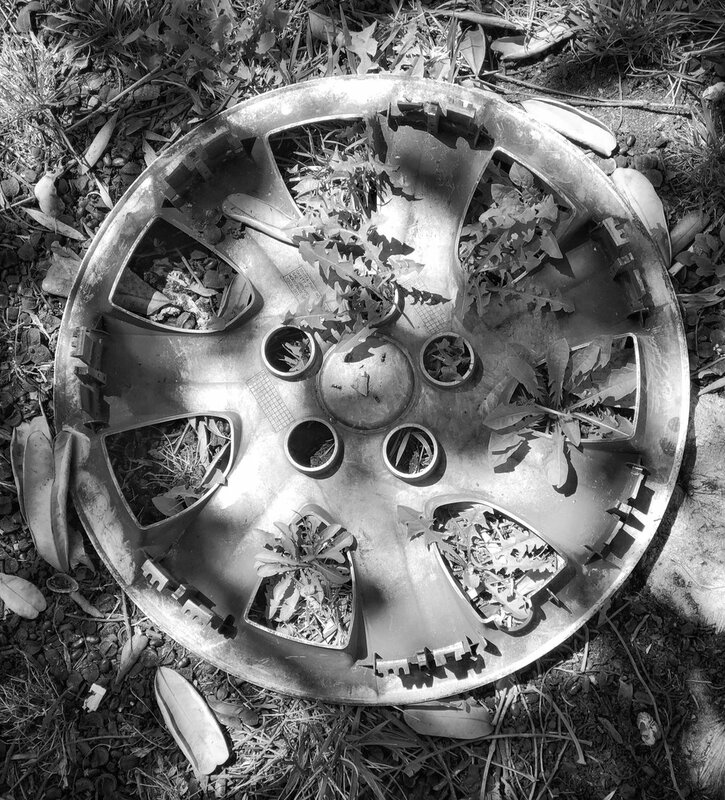 It's funny, and I have no idea why, but after I saw this hubcap image it caused me to remember an incident from back around 2000 when I was still a Detective. I was called in to work after midnight to help investigate an attempted murder at the Copperwood Apartments. The "victim" had been shot in the hand and was lying to the the lead Detective about almost everything, we eventually suspected the shooting was over a drug deal gone bad. My buddy and I were assigned to go try and find the actual scene. We were confident the shooting happened at the apartment complex but we knew the victim was lying about where in the complex because there was no physical evidence where he claimed he had been. So there we were, out past 2 am, walking through the parking lots of the complex looking for victim's knuckle, a blood trail, and any shell casings. I remember commenting to my friend how surreal it was to be out in the middle of the night, in Chino, looking for a body part. Then followed it with some comment like what did we do wrong in life to end up here. We searched for about 45 minutes until I found the guy's knuckle and the blood trail about 100 yards away from where the victim said it should be. At that point it was a little eerie because we were pretty sure the suspect who shot the victim was probably still there in one of the apartments a few feet away from us. I guess it was the parallel of looking for details on the ground that brought this memory back. I also find it interesting how many different things I see on the ground, probably from looking for too many shell casing and too much dope during my career. One last thought about the process of seeing images and photographing. Its easier for me to photograph on the street when I am travelling than when I am home, unless I am going to a local destination I have been photographing like Santa Anita. I have had the urge to photograph locally more and photograph more in general. Often the desire to look for images happens in the afternoon during golden hour, when the light is most dynamic, and the light drives me. Even though I often don't find any great images when I go out specifically to photograph. But the process of looking for images is still a good thing. Like with anything I guess, the best skills are developed through knowledge, evaluation, practice and repetition. Above are a couple versions of an image from a trip back east a couple weeks ago. I was out photographing and got off the freeway on the way out of Providence and found this image right off the freeway. As I talked about above, I was dawn to the shapes and form with this image. I think there are layers of meaning here too with all the patches covering the graffiti. 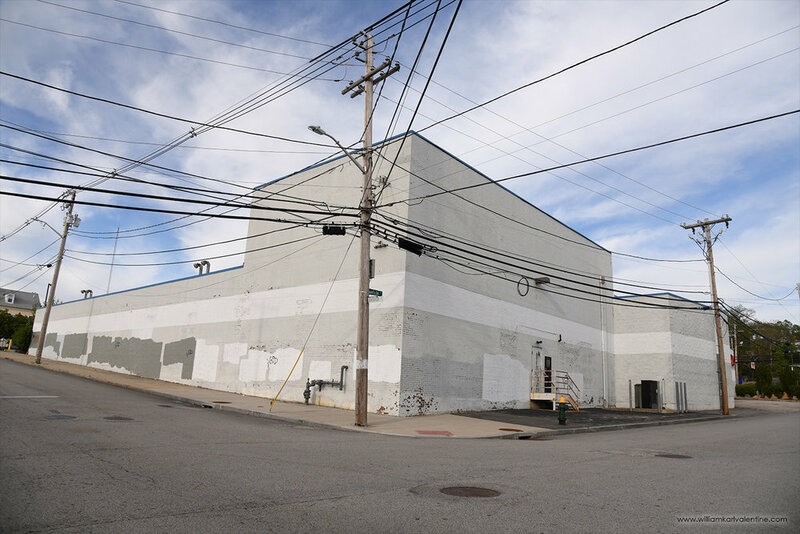 Is it a bad area?, but then with the graffiti covered up someone is trying to make it better, but then the building still looks vacant, and the wires conjure up even more thoughts. Also, on a personal note, the image reminds me when I was still an architecture major and was learning how to draw perspective drawings with horizon points.